B osch have to be up there as one of the most trusted names in the world of electric lawnmowers, and when it comes to corded mowers they have few real competitors. Here we’ll take a look at their efforts in the sometimes dicey world of battery powered mowers and see what they have been able to deliver. Firstly it’s important to note that although the price tag may be slightly eye watering, this is common among the best battery powered lawn mowers, in fact one of the factors that still holds them back from competing with their more powerful petrol equivalents is that they carry such a weighty price tag. 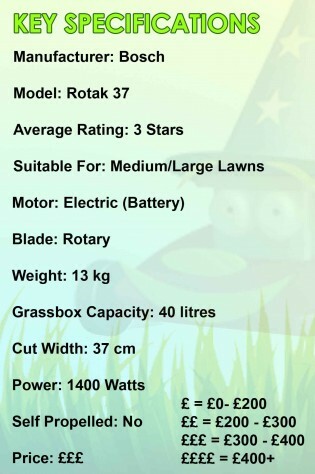 None the less this is a highly functional mower, and like others in the ‘Rotak’ range it has a range of features to ensure you get the best mowing experience for your money. With an ergonomically designed handle bar, with the option for holding the power control comfortably in either hand, there is little competition on the market for user comfort. Also like the others in its range this mower includes ‘grass combs’ to aid with edging, again a unique Bosch feature. 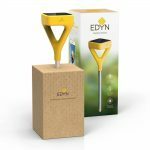 Looking specifically at the battery power on offer, this obviously increases the weight of the mower, but at 13kg it could be far worse, in fact there are corded mowers on the market which are heavier. In terms of performance, the amount of juice you’ll get from the battery varies, but you could be looking at up to 30 minutes of cutting time. Although this mower isn’t designed for large gardens that still doesn’t sound that great to us, it would be handy if a little more contingency were built-in, should you find yourself battling with a particularly stubborn area of grass for any reason. That said, the charge time is only 30 minutes, so you won’t have too long to wait should the battery run dry. Price – despite the improved freedom the battery provides, the cost is always going to swing things in the favour of the more powerful petrol mower for a lot of people. There have been reports of the battery failing within just two or three years, so it’s really worth paying attention of Bosch’s recommendations for storing and looking after the battery in particular! 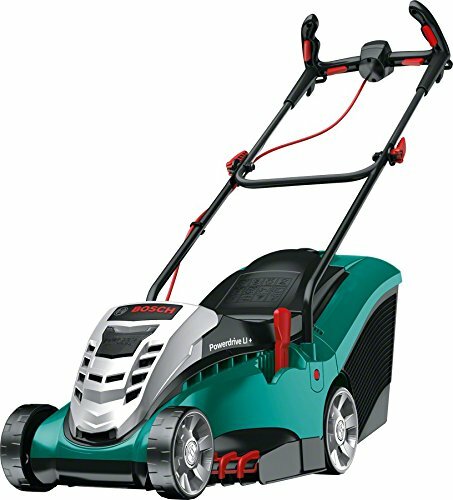 Whilst this mower is, like all Bosch lawn mowers, a perfect example of how to cut and roll the grass effectively and comfortably, it isn’t the greatest example of a battery-powered mower on the market. So unless you have a specific reason not to get a corded mower, we would suggest sticking to one of the other proven models within the Rotak range. None the less, if you check out other’s bosch battery lawn mower reviews you might get a different perspective that we haven’t thought of.